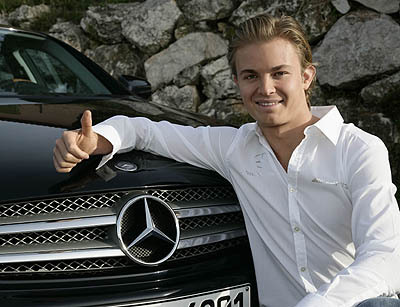 +1...if Kimi/Nick joins Merc, I'll get back a 'dream team' since DC and Kimi at McLaren. MercFan a écrit: +1...if Kimi/Nick joins Merc, I'll get back a 'dream team' since DC and Kimi at McLaren. If Kimi signs or dosent sign for them,I guess they will be the team i cheer for. That is a real strong commitment. well its them and redbull the way i see it. I fan them most of top teams. Only if Kimi returns, and to Red Bull, I might like another team more. Interesting Zonked - but the article says ...... MERCEDES GP SIGNS LONG-TERM AGREEMENT WITH PETRONAS ...... no mention of Mercedes "AMG"? !!! Schuy1 a écrit: I'm in too ! my bad,originaly when I started the thread it was merc amg on the site i got it from,never mind. Zonked - I was going to say - because you started the thread, just go to your first post, hit "edit" and change AMG to GP - but I now notice it's "Mercedes Fan Club" - that will do fine !! But thx enough for thinking about it. Zonked a écrit: I know that . the OFFICIAL F1 site a écrit: Q: Michael, welcome back to Formula One. Your signature on the contract has hardly dried - can you say something about the content of your contract? Michael Schumacher: Yep, the deal was done only hours ago. Regarding the driving, the time frame is three years. There was never any intention to do a one-off. There will be an option after that to be brand ambassador for Mercedes, which would make sense in a way. I dunno, but he said he didn't want to do a one-off. Probably if the car is not good in the first year, he'll be more motivated in the next. No idea, speculating only, but I think it shows that the Schu is really committed. I might end up cheering for him, which is kinda strange feeling being a "hater" for all these years. BTW, Formula1.com had this atricle up pretty soon after it was announced, but yeah, most of the press was talking about a 1 year deal, I remember... we don't know the details, probably we never will, but that's fine. guesswho's back a écrit: I dunno, but he said he didn't want to do a one-off. Probably if the car is not good in the first year, he'll be more motivated in the next. No idea, speculating only, but I think it shows that the Schu is really committed. I might end up cheering for him, which is kinda strange feeling being a "hater" for all these years. ....you could do a lot worse !!! Mercedes Michael Schumacher wrapped up his three day GP2 test in Jerez by completing 130 laps of the Spanish circuit. He was testing in preparation for his Formula One return with Mercedes next season, having spent three years out of the sport. He covered 715 miles over the three sessions, 360 miles of which was on the final day when he got the most dry running on slick tyres. For comparison, a full F1 race distance is typically 190 miles. "I could really drive a lot on this last day of testing and it worked out perfectly," he said. "I am very happy with the way testing went here: we worked well, times and consistency went well, we could do everything we had scheduled to do. I feel fit, I felt comfortable immediately back in the car - hey, let's go for it!" I feel fit, I felt comfortable immediately back in the car - hey, let's go for it!